Designed with a low cavity volume of 0.11 in3, virtually eliminating particle entrapment, the GCT-225 can be easily purged. All wetted parts are 316L VIM/VAR stainless steel passivated to 5 Ra (7 Ra. max.) fi nish, which eliminates surface irregularities and provides the proper surface chemistry for corrosion resistance, assuring contaminant-free gas distribution. Every sensor is mass spectrometer helium leak tested to 1 x 10-9 ATMCC/sec. 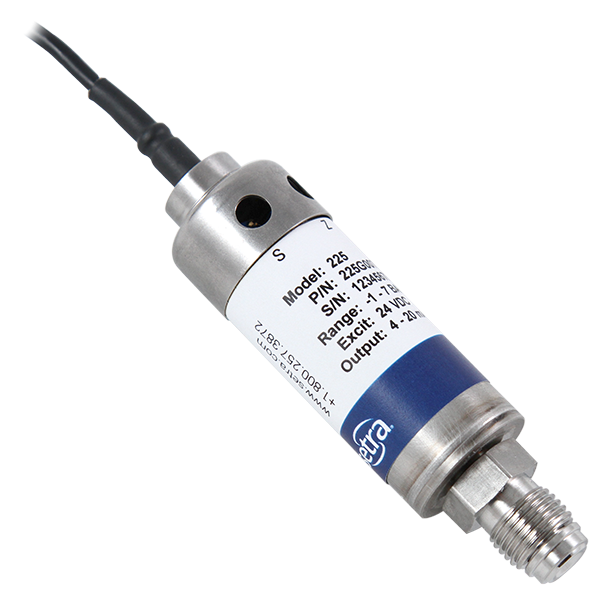 The Model 225 Series comes with a rotatable cover for easy access to 12-turn potentiometers for zero and span adjustment. Standard swivel male or female face seal pressure fittings meet the semiconductor industry requirements. In addition, several other fittings styles are available. The 225 if offered with a 5 VDC, 10 VDC or 4-20mA output. A six-foot mult-iconductor cable or Bayonet connector is provided for electrical termination. Setra's patented variable capacitance sensor features a VIM/VAR 316L stainless steel diaphragm and an insulated electrode plate. A variable capacitor is formed between the sensor body and the electrode plate. An increase in pressure causes a slight rounding of the diaphragm, which decreases the capacitance. The capacitance change is detected and converted to a highly accurate linear DC electric signal. Setra's unique custom integrated circuit, utilizes a patented charge balance principle and is virtually EMI/RFI immune.